This rich and flavourful dish showcases the best of British game. To make the game, heat the butter and olive oil in a large frying pan over a medium heat, then add the thyme and garlic. Add the pheasant breast and pan-fry, skin-side down, until lightly golden-brown. Turn the breast over and continue cooking, until almost cooked through, but still a little pink (or longer, if you prefer your meat well done). Remove from the pan and set aside to rest. Repeat with the remaining breasts, ensuring the juices run clear before you remove them from the pan. Pour the brandy and vinegar into the pan to deglaze, scraping off the residue from the bottom of the pan. Bubble over a high heat for 4–5 minutes, or until the liquid has reduced to a glaze. Add the truffle oil and set aside. Return the breasts to the pan with their resting juices and spoon over the glaze. Keep warm. Meanwhile, to make the risotto, heat the oil and 25g/1oz of the butter in a frying pan. Sauté the leek and thyme on a medium-low heat for 7–10 minutes until soft and translucent. Add the wild mushrooms and drained porcini mushrooms and cook for a further 5 minutes. Stir in the rice. 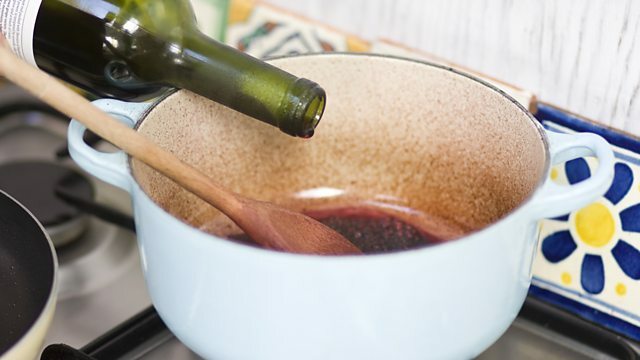 Pour in the wine and simmer until the liquid has almost reduced, then add a ladleful of stock. Cook the rice, stirring continuously, until the stock has been absorbed. Continue to add the stock, a ladleful at a time, until the grains of rice are plump and creamy. This should take 15–20 minutes. Stir in the Parmesan and cream, then season with salt and a squeeze of lemon juice. Stir in the remaining butter. Spoon the risotto onto four serving plates. Slice the game breasts and arrange on top. Spoon over the resting juices and serve.